Date & Time: Sunday, April 27, 2014 @ 6:45 a.m.
As you can see from the map, the Big Sur Marathon course starts in Big Sur and winds up the coast to Carmel via Route 1, the Pacific Coast Highway. Much like Oakland, there’s a huge climb (Hurricane Point) about halfway through the course. However, from what I’ve read and heard, the most difficult part of the course is the last 6 miles, through the rolling hills and canted roadways of Carmel. In particular, I’ve read in many recaps that the hill at mile 25 seems ginormous because your legs are really beat up by that point. Big Sur is known as one of the most beautiful marathon courses in the world. Part and parcel with that its remoteness, and as a consequence, the only spectators for a majority of the race will be the aid station volunteers. Maybe I’ll be lucky and make a new running friend. I might pack my earbuds too, just in case I get tired of the amazing views. Ha! It’s looking mighty fine! High of 63F and low of 47F, with a mix of sun and clouds. Winds at 8 mph — which is a relief, because headwind has been a serious obstacle in years past. Hopefully there won’t be much fog obscuring the view. As far as time goals go, it would be nice to PR (4:32:39, CIM ’12). Having just run the Oakland Marathon in 4:46, I feel confident that I can come in at least 10 minutes faster at Big Sur as long as I don’t cramp up or have any other significant issues. So my A-goal is to PR and my B-goal is to finish in 4:36. My other major goal is to take time to enjoy the scenery. Having driven down this stretch of highway before, I can only imagine how awesome it will be to savor the view without worrying about driving off the road or getting car sick. I plan on going out very, very slowly in the first 2-3 miles, which will be difficult since it is downhill. The idea is to ease into the race and not attack the climb up to Hurricane Point too hard. My goal is to stay behind the 4:30 pace group at least until the halfway point. I think that’s where I went wrong at Oakland – I went out too hard (for the course) and used up all of my energy on the climb up to Montclair. @dine_and_dash Watch out for first 4-miles. All downhill & there will be urge to go too fast & tire yourself out. Other than that, have fun! My general strategy is to be fairly chill during the first 20 miles and then really try to race the last 6.2. For Oakland, I focused a lot on enjoying the race, which meant that when things got hard, I gave up rather easily. However, for Big Sur, I’m ready to embrace the hurt and leave it all out on the course. I want to have my cake (“enjoy the course!”) and eat it too (PR!). So that’s the preview! Anyone else out there running Big Sur on Sunday? I’d love to meet up or say hi. If you’ve run Big Sur before – any tips or advice? p.s. I don’t have my bib number yet, but My bib number is 1150, so if you want to track me, I believe you can do so via smartphone apps from iTunes and Google Play. I am so very excited for you about Sunday, it’s going to be beautiful. Take lots of photos!! Clearly I am NOT a marathon expert and don’t want to pretend I am, but I would question why you want to go out slowly for the first few miles? Obviously I understand about not wanting to fly and die, but equally, I personally wouldn’t want to hold back unnecessarily on that first downhill, it looks like a bit of a gift. Use the downhills, carefully! Hope you have an AMAZING time! Really really excited for you. I tend to be more of an “even splitter” myself…I try to run most of my miles right at race pace with the first 3-4 about 15 seconds slower per mile with the knowledge that I’m going to slow down at the end no matter how conservative I am at the beginning. BUT if negative splitting and starting off very conservatively works for you, definitely go that route! @Cathryn: We discussed my strategy last night, but I also updated the post to clarify my intentions. I’ll try to take lots of photos! @Amy: I would LOVE to run an even split, or to be only slightly slower towards the end, but as it is, my latter miles tend to creep up to a minute or more per mile (! )… this suggests that I’ve always gone out way too fast. So going out conservatively is my attempt at reining it in a little. Good luck! Don’t shred your quads on the downhill – but early downhill looks relatively gentle, you should be all right. Have fun and enjoy those scenic views! The Oakland profile scares me more than Big Sur, and I think you’ll be fine. Although I’m a big fan of going out slow, that downhill start does look a little tempting – but I’ve never ran a marathon so don’t listen to me! Have a great time and let that beautiful scenery act as fuel! I totally agree with you about the profiles – Oakland is scarier to me than Big Sur as well. As for the downhill, I’m going to try to go with the flow. Like I wrote in the “update” section, I plan on coasting down the hill with minimal effort, including lack of braking! Good idea about using the scenery as fuel — I like that! Good luck! It will be beautiful! WOO HOO! Good luck on Sunday! And remember: no matter how tempting it might be for you to jump off that big bridge, DON’T DO IT! You’ve got this! Thanks for the support, Amy! I hope I’ll have some good news to report on Sunday. You’re gonna die on those hills, I see failure in your future. Maybe reverse psychology will propel you to a PR this time? Enjoy the views and have fun! But just know that if you PR then I promise to do this course next year…so don’t PR because I really don’t want to deal with the training for this. Haha, I think you might be on to something with the reverse psychology and the dare to PR… that’s serious motivation right there. Great links! 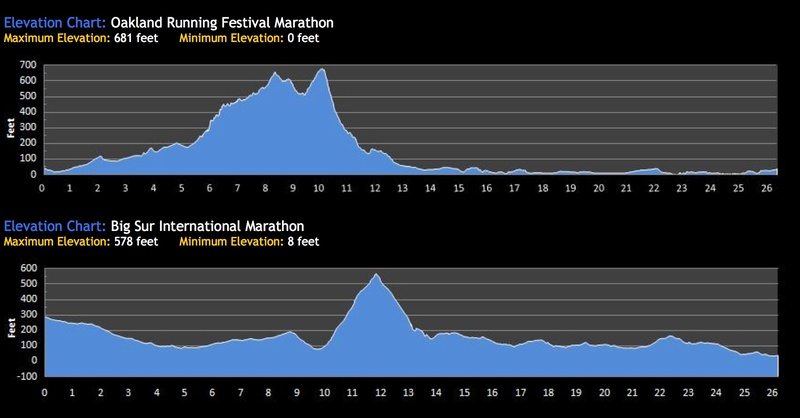 I had not seen the findmymarathon.com site nor the Big Sur course videos! Woot. Sounds like your plan is on-point and you’ll do great! See you there! Thanks, Kathryn! Hope you find those links useful and good luck on Sunday! I have no advice on the marathon itself, but I’ll be there too doing the 9 miler. 🙂 One day I’ll do the full there. Just that it easy the first half, don’t trash your quads on the downhills and enjoy the scenery!! Very excited for you. Thanks, Sonia! Good luck with the 9 miler! I agree, seems like a good idea to run a little quicker down the downhills (as long as it feels easyish) if there are some decent rollers in the back half. This is a bucket list race of mine; I hope you soak it up and have fun, whether or not you PR (though I think you will)! Good luck! Thank you! I think that knowing so many people want to run this race motivates me even more to be grateful for the experience. Thanks, Yang, for the good wishes, for reading, and for commenting! The weather was fantastic, though the one downside to having no wind was that the music from the piano didn’t travel well at all! In fact, I was more than halfway down Hurricane Point before I heard it, and even then, only very softly — whereas I’ve read reports of people being able to hear it from the top! Hope you get your cake and eat it too! 🙂 Don’t forget to call mom and wish her happy b-day. I’ll be thinking of you while I eat a half-price gelati with my family.